Admittedly, I’ve struggled with cooking salmon for years now. Coooking salmon seems like such a basic skill. A little too much heat and salmon can get very dry, still edible but a far cry from that perfectly moist, tender, and cooked result you expected. Justin Chapple at Food & Wine’s Mad Genius kitchen solves our salmon woes. The answer to perfectly poached salmon after the jump! Kiwis have amazing health benefits and yet they’re difficult to incorporate into your normal eating habits, probably because the peel is so tricky to remove. You just end up with a lot of kiwi fur on your knife and no one wants that! Food & Wine has a great trick for peeling kiwi to avoid catching the fur while saving as much of the fruit as possible. Check out BuzzFeed’s list of 33 3 Ingredient Recipes. I’ll post some 3 ingredient recipes of my own soon, with healthy choices. Broo-sket-tah, Italian for fabulous appetizer, is my go to dish for dinner parties and potlucks. It requires minimal effort and you can bring something dazzling, flavorful, and healthy to the table. A small batch of bruschetta goes a long way. I made a small dish and it served 5, easily. Consuming tomatoes provides an array of benefits to your health, including reducing bad cholesterol, improving skin, making stronger bones, fighting cancer, regulating blood sugar, making hair shinier and stronger, and preventing kidney stones and gallstones. To avoid using white bread, I served bruschetta with whole grain wheat toast for a healthier take on the traditional recipe. In terms of taste, they say the uglier the tomato, the tastier it is. Here, I used 10 ounces of mini heirloom tomatoes from Trader Joe’s. If you’re looking for a new recipe for smoked salmon, this mango salad is a satisfying and fresh plate. It’s also low carb. Yay! Chef Steps Chicken Noodles. Mind Blown. If you haven’t signed up to join ChefSteps.com, I highly recommend it. They also have a great YouTube channel. ChefSteps provides an array of recipes ranging from easy to advanced, and when they say advanced, the complexity is up there with Iron Chef gods. This chicken noodle soup recipe blew my mind. At first glance, it doesn’t look like anything special. However, the chicken IS the noodles, making this instructional video far from mundane. I cooked scallops for the first time last night. I was nervous about cooking to the perfect “done-ness” but the process proved to be pretty fail proof. This recipe was also improvised and I love how it turned out! 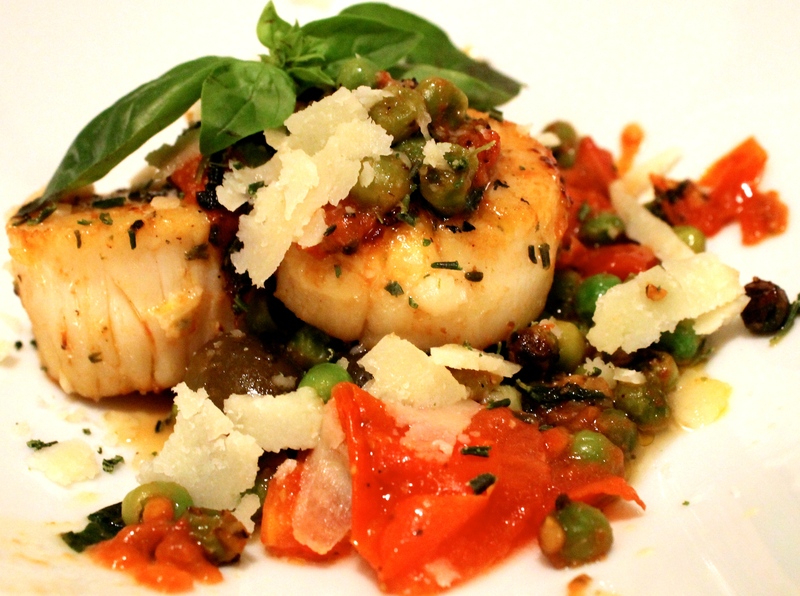 The tomatoes, basil, and rosemary add so much flavor but the dish isn’t drenched or submerged in a stew, allowing you to appreciate the taste and texture of the scallops on their own. Spring has officially begun this week but I’d like to fast forward to summer. It’s still a bit chilly in San Francisco and I cannot wait for warmer weather. 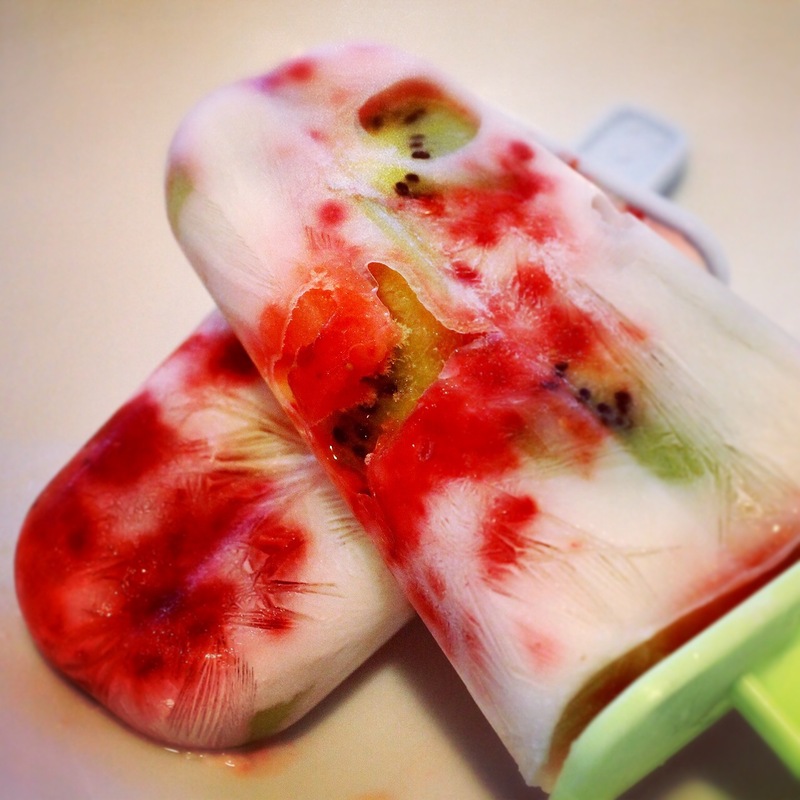 In the meantime, I’ve made healthy fruit popsicles with strawberries, kiwi, non fat plain Greek yogurt, and unsweetened almond milk. No added sugar! Sometimes I forget that vegan cooking can be quite simple. 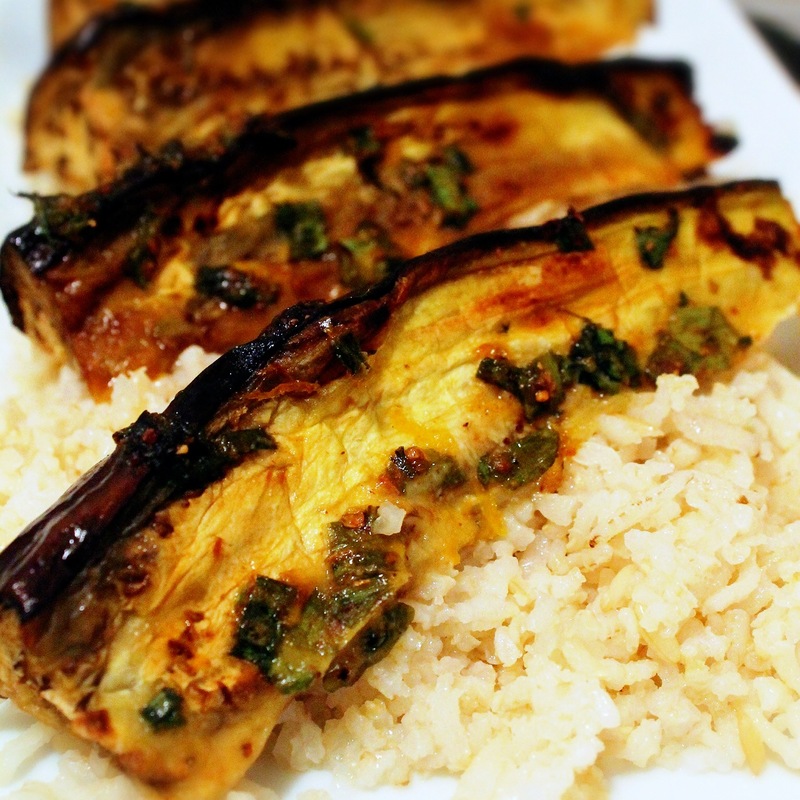 This eggplant dish is a great lazy meal since it only takes a few minutes to prep. The rest of the cooking time is baking in the oven so you can set it and forget it. Did you know that there are 14 varieties of eggplants? Here, I used the most common one found in American grocery stores – the American or Globe eggplant with its bulbous, pear shape. If you’d like to create this dish with better presentation, try substituting with the Japanese eggplant with its long and thin shape, cutting in half lengthwise. You can also garnish with fresh green onions or chilies. Most recipes for peanut sauce for satay or dipping sauce for spring rolls call for a handful of ingredients. The big secret is that you only need 3 ingredients! 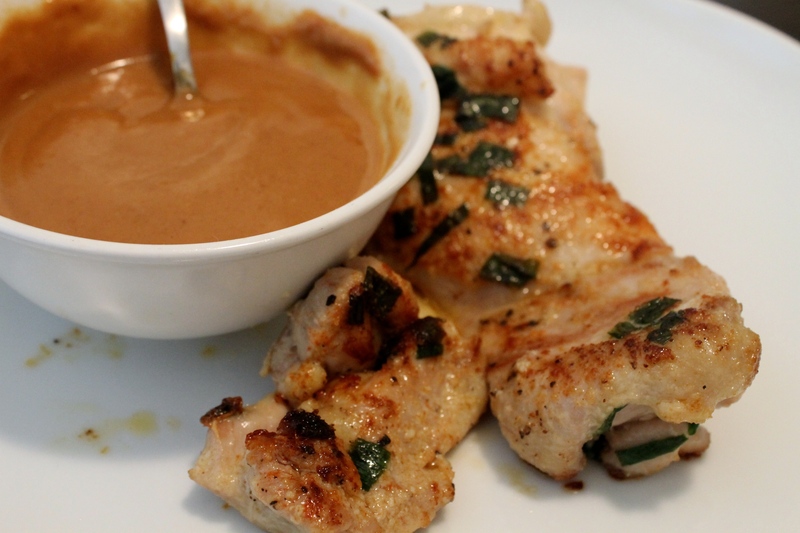 Chunky Peanut Butter + Hoisin Sauce + Water, that’s it! More specifically, you need 3 parts peanut butter to 1 part hoisin sauce. Add water to yield desired consistency. Microwave for 15 seconds to help the sauce mix. Mix slowly with a spoon or whisk. Add 1 tablespoon of water at a time, mix, then add more water if the sauce is still too thick. Garnish with fresh chopped peanuts. Recipe after the jump for chicken thighs.